and here at Hooked on Houses!! 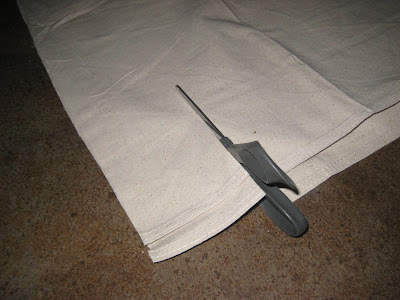 I used a 9x12 drop cloth from Lowe's for my fabric. This is larger than I needed but I will use the rest for an upcoming project. I then used a $1 tree skirt I purchased at the Dollar Tree for my pattern. I wanted mine just a bit larger so I added about two inches all around. Then I cut my strips for my super cute ruffles... I cut 4 strips that were each 9' long. 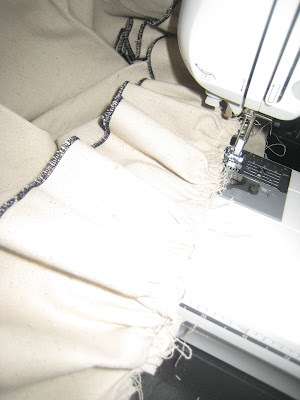 I wanted to do a fun edge rather than a usual hem so I decided to do a rolled hem using my serger. You just run your fabric through and it does the rest... woohoo! 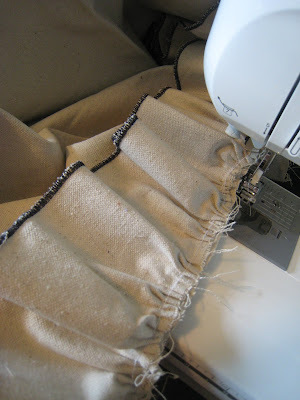 If any of you want some tips on a rolled hem, you know where to find me. Now to introduce you all to my favorite foot :) This is my ruffler. 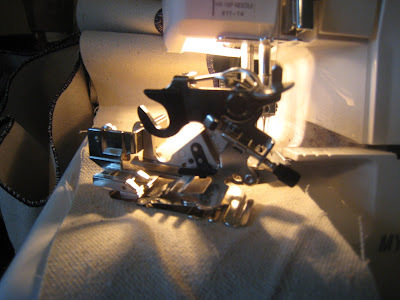 For those of you with a sewing machine that do not own one of these... it's time to ask Santa. This baby makes a ruffle in no time and had adjustments so you can pick how full you want it. So I spent about 2 minutes running 12 yards of fabric through my ruffler and I was finished. 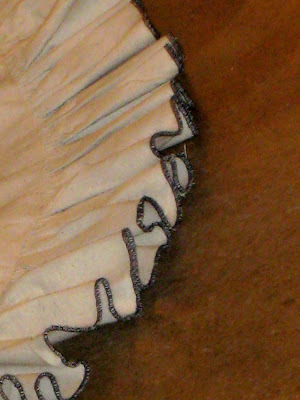 This is what my ruffle looked like before I attached it around the edge of the skirt. I then attached my 12 yards of ruffles to my circle piece using a straight stitch. I finished my raw edge where the skirt is cut to fit around the tree and added two pieces of twine for the ties. My final step was to cover up the shanty tree stand and then take a bunch of pictures:) What do you think?? Not too shanty for $9 and 30 minutes I think! Thanks so much for stopping by! 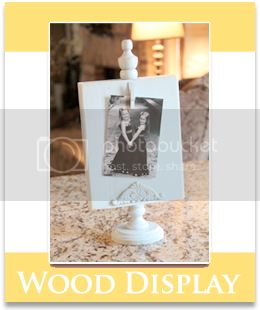 I hope you guys have a great weekend and I can't wait to see all your goodies for the Rust-Oleum Revamp on Sunday!! Get those posts ready!! If you still need some info on the party you can click the button below. Thanks again!! Shut Up..A ruffler that ruffled 12 yards in a snap. Santa we need to have a serious talk, I have been left out far to long. This skirt is just the sweetest thing ever. I love it. You did an outstanding job. Thank you so much for sharing. I love sewing projects! 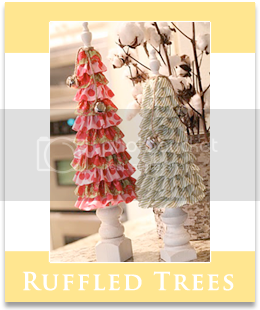 I have a tree skirt that I like, but it would be so sweet with a ruffle. Thanks for the idea! that is so stinkin cute!!! a RUFFLER??? i Must have one!! this is adorable btw. Okay, seriously? A ruffler? Why don't I know about this foot? I'm not much of a seamstress, but I really think I need that. Is there a technical name for it, or do I just ask for the ruffler foot at the fabric store? Love your tree skirt. I've been wanting a cuter one but haven't seen anything that I love. Yours is PERFECT! Thanks for sharing. Oh my gosh... that is one killer ruffle. I had no idea a machine just DID that. Love the stitched detail on the edges! Another wonderful invention! Thanks for linking it up! I love this. So cute! It's times like this when I really wish I could sew. Your tree skirt is super cute!! Why have I not ever heard of a ruffler foot?!? I need to go out and get one AND I need to figure out how to do the rolled hem on my serger! You gals come up with the best ideas! Oh my goodness, that is so cute. Thanks for sharing. You had me until I saw the sewing machine. What an incredible idea. Those ruffles are just beautiful. I think that this is my very favorite out of all of the great projects that you've posted. Love it! I've considered getting a ruffler foot and just have never done it. I may have to do so now! Great job! I have my Grandma's old Singer. So old it only does a straight stitch and is has a sep foot for doing a zig-zag. LOL. It came with a box full of special feet and I am thinking that a ruffler is one of them. I am going to have to do some experimenting once the Christmas season is over. I am so making this for my themed tree! What a fab idea! Filing this one at thecraftersfilebox.com. I love drop cloths. I use them for everything, including cheap drapes that look great. Love your tree. Beautiful. SOOOO Cute I need a ruffler too! 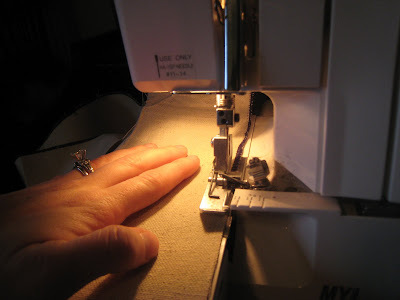 I love sewing! I wish I could sew like that - I am in absolute awe of this tree skirt and your skills. A ruffler?????? I need one. Now. Wow! I gotta get me one of them thingees! Makes ruffles that fast, get out of here! 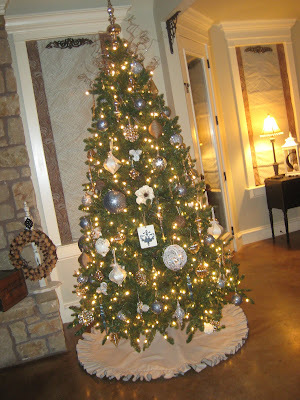 I love your tree skirt and who would have thought to use a drop cloth! Thanks for sharing. love it! love the ruffle. this would be great done in burlap too. beautiful tree! Love it. I have a serger and have never used it- I am afraid of it I guess. Might have to learn now. And the ruffler- never heard of one and I have sewn forever. Does it work on any machine? thanks for sharing all your projects but seriously - how do you find the time to do so many cool things? Just darling! I wish I would have thought of it. Wow I love the tree skirt and you made it sound and look so easy! OK ~ I want to give you a big hug! I am going tomorrow to buy THE RUFFLER!! I have never heard of one - though I am just a self taught girl with a sewing machine! Thanks so much for posting and your tree and tree skirt look fabulous! Happy Holidays! I don't know anything about sewing machines. But yours looks great. Wow! : ) The skirt looks really great with your tree. That is such a great idea! 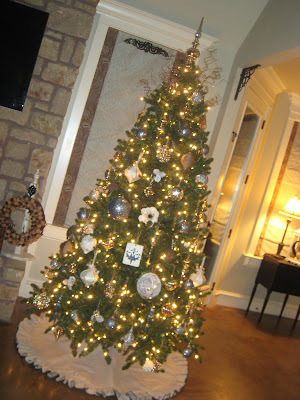 I strongly dislike the tree skirt we have now... it is more then aweful! I may have to sew one of these and wrap it up as a gift along with the ruffle footer... is there one available for regular sewing machines too, I am guessing yes. I will have to scope it out. Thanks for sharing! I love it!! 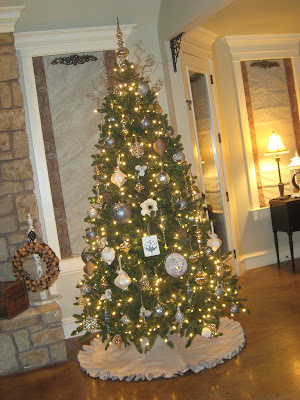 It turned out so wonderful, I wish I had better sewing skills:) Beautiful tree. Beautiful tree skirt. I so love this!! What a great job! Super cute! Love the ruffles! OMG, this is adorable!! I LOVE the ruffles! I had no idea there was such a thing as a ruffler foot, but I am adding it to my Christmas list! Whitney! I love it! You know I love dropcloths! I love the ruffle so much. It looks gorg. Mom told me she wanted me to have her sewing machine and serger before she passed away. I am so thrilled to have them, but I don't know how to use the serger yet. I am hoping to figure it out after Christmas when things settle down. I know it will save me tons of time. Great job girl! Oh I love it! I've GOT to figure out the rolled hem on my surger. A drop cloth may be in my tree's future. So cute! I love it. I have already asked/begged Santa for a sewing machine, do you get the ruffler thingy separately? Okay, it is official...I want a NEW sewing machine that actually sews without the thread breaking! I'm asking poor Santa for one. Of course, I want a ruffler, too. You girls are "sew" creative! Projects like this is why I am teaching myself to sew...I love this tree skirt! Just beautiful! Whitney! This is so AMAZING!! I am speechless that is such a gorgeous tree skirt!! I absolutely LOVE this! It's gorgeous, you did an amazing job! I love this on so many levels! It's totally cute. Love it. This is really cool. 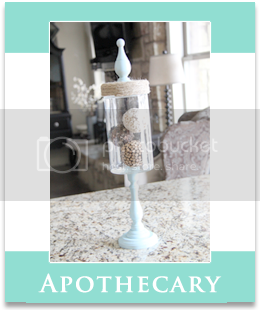 . . Fun and chic AND functional! Good for you! This is, without a doubt, my favorite project I've ever seen on here. Amazing! You've inspired me. I've had a serger sitting in my closet for about three years now, and have never learned to use it. It's time to learn...if for no other reason than those ruffles!! I love the ruffles. Darling. So so cute! 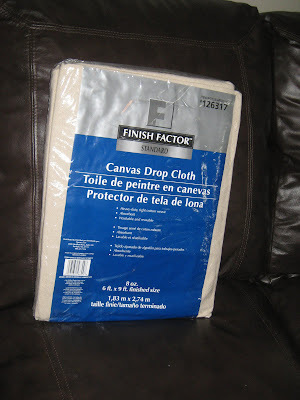 What can't you use a drop cloth for? Great idea! So cute! I have been wanting to make one for a while now.....just needed someone to show me how:) Thanks for sharing! I love this!!!! It's beautiful - and I'm all about ruffles!!!! Those tree skirts (out there!) 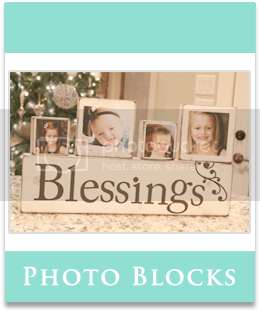 are so expensive, and this is the perfect frugal-yet-elegant project! luv this skirt...and now i know what to ask for christmas...a ruffler? who knew! thx! I love your tree skirt ! 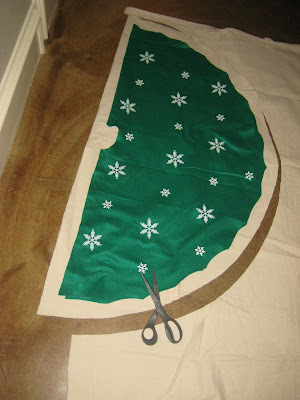 I wanted to try a patchwork tree skirt, but your idea looks MUCH MUCH SIMPLIER ! Love the tree skirt. 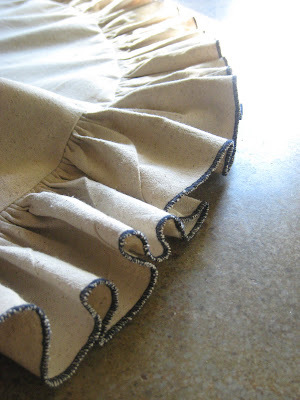 In case no one knows you can sew and ruffle in one step, give it a try!! I think your blog is great!! What a fabulous idea and even better outcome. Beautiful! Great idea. I have one of those rufflers for my machine, if I could only figure out how to use the thing!!! I just can't seem to get it right, but seeing your results I am going to try again. LOVE the tree skirt. It really adds a lot to the tree. Cute, cute!! That skirt is adorable! If only I could sew... darn it! You did a super job on your tree skirt! The ruffle just makes it! I had a ruffler once for my sewing machine - but I burned it up making a ruffle for my mother to put on a bedspread she's made! I never bought another one. Love it. Pure simple perfection. Oh now I need to add a sewing machine to my Christmas list! I think this skirt is absolutely fabulous. I love the ruffles! We had snow in Houston and of course everything shut down here. Merry Christmas! I'm adding this tut. 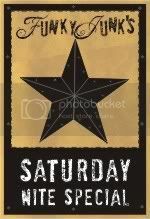 to my Inspire My Saturday post. Thanks so much for sharing. It's lovely. Hey, Shanty girls!! I adore that skirt you made, it is genius. Thanks for joining the party! I am soooo loving the skirt!!! Wow it looks so good! So dang creative you two are! 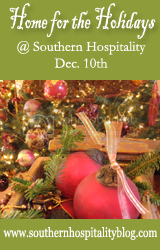 I am hosting a chocolate giveaway on my blog...stop on by to enter. Turned out great and looks wonderful on the tree. I absolutely adore this idea!!! you're so creative! Thanks for sharing! So glad I came across your blog in the party! What a beautiful tree skirt! Thank you for sharing. This has been added to my "things I want to do but will probably never get to list... " though I hope that I actually get to it before next Christmas! Wow, what a great idea!! Thanks for sharing your tip!! Merry Christmas! Ok by the amount of comments you've received, you've got to already know that you've outdone yourself on this lovely tree skirt! Love the natural look of the canvas under the tree. How cool. Beautiful tree.